Walmart Grocery Pickup + Discount Code for your first purchase! Walmart grocery pickup has easily been one of the easiest decisions I have ever made as a mother. I have written about it before in my “sanity saving tips for Moms” almost two years ago and I still stand by it today. There are so many stories I related to why Walmart grocery pickup has changed my life for good, but here is a “fun day” to paint a picture for you. It was a wintery day. The kind that makes you want to turn your bed into dreamland and only come up for a hot bowl of soup. It was time to get the kids off to school and the baby was ready for his morning milk. I tiptoed downstairs in an effort to keep my three year old sleeping because any ounce of sleep we can save with him goes a long way. We recently had entered the “no nap” zone which as any mother who has been through this knows is a tumultuous time at best. We also happened to be in the process of potty training so some days felt like an all-out war zone. My two oldest were sitting at the counter eating cereal and to my dismay it was the very last of the milk we had in the house. To make matters worse we had a doctor appointment that morning and I knew that I would have to go to the store in the “meltdown” hour. You know the one, right after your busy morning and between chores and lunchtime. I loaded up all the kids and very gently woke up Jett so we could make it to our scheduled doctor’s appointment for our baby’s well checkup. Taking two little ones to the doctor is okay, but keeping the older one entertained and un-traumatized during the immunization witnessing is another thing. We made it through mostly unscathed, but I knew I would need ibuprofen on hand in case the baby ran a fever, and we desperately needed milk. Jett was happy enough to go in the store and I had a mental checklist of the absolute must haves so we could get in and out in a hurry. This was about the time Jett announced he needed to use the potty. My cart was full, the baby was a bit upset, and when Jett said he needed to go, that meant he really needed to go now. Meanwhile a darling woman in the stall over giggles at this exchange. I make a remark about how I am glad that at least someone can see the moment in its hilarity, (in honesty), because at the moment I didn’t feel like laughing at all. “I am sure one day I will feel the same,” I said out loud and laughed a little bit. We eventually made it out and in the chaos I forgot to buy the medicine. Being in the potty training mode that we were Jett did end up having an accident which resulted in a meltdown and a major mommy crash of energy. And this my friends is why I am in LOVE with Walmart Grocery Pickup. 1. Grocery shop from the comfort of your own home. I have now adopted a new system/habit of meal planning and grocery shopping on Sundays. I will schedule grocery pickup for the next morning and it gives me a great start to the week knowing that we have our meals and the groceries we need for the week set. 2. Save money by skipping the aisles you don’t need and avoiding impulse buying. If you don’t see it you’re not going to be tempted by it! This has also helped me with my healthy eating goals because I am not tempted to buy something that I just happen to see in the store. Hello doughnuts! 3. Have “your favorites” saved in the grocery app or online so re-ordering is a breeze. 4. Avoid the germs of the grocery carts by never having to touch them! They say this is a record high of 8 years for germs being shared in public places and so I appreciate having to avoid the crowds and carts. Anyone else a germ-o-phobe like me? 6. Don’t waste time hunting for an ingredient that you can’t find. You will have a personal shopper finding all of the best things for you. If for some reason your item isn’t on the shelves they will give you a substitute (if you request) and often times you’ll get the name brand for the same prize or a larger quantity. 7. Avoid lines, melt downs, potty breaks and tantrums. When you set your time for pickup it is ready to go! You will have a sweet Walmart personal shopper come right out to your car and load up your trunk for you! This is pure heaven! Pure heaven! 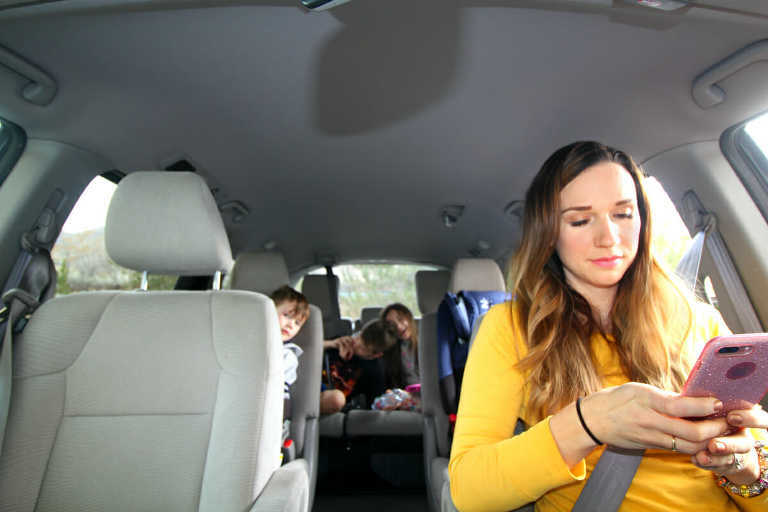 You can feel really super and smart as you have your car loaded with all of the goods. Check into your phone to let them know that you are nearby. 8. Order gifts and household items. One thing that I love the very best about Walmart grocery pickup is the ability to pick up spray paint, Birthday gifts, organizing jars or baskets. It isn’t just food, and this has saved me so many times. 9. Shop for holidays when you don’t want your kids to see what’s in the cart. Easter? Christmas? Buy some surprises and don’t worry about little eyes seeing your stash. Walmart will give you the ability to buy seasonal items and pick them up just like that! 10. You can create systems of meal planning and pick up that will keep you sane. Especially for those who have meetings, nap times, school activities, life, and sporting events. I think that covers all of us. 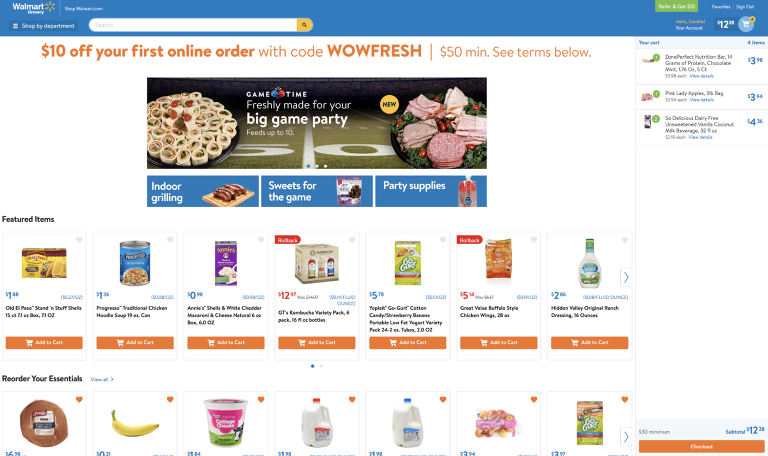 Use the code “WOWFRESH” for $10 off your Walmart grocery pickup order if $50 or more. You can also earn grocery cash by referring it to your friends. Trust me, you are going to love it.